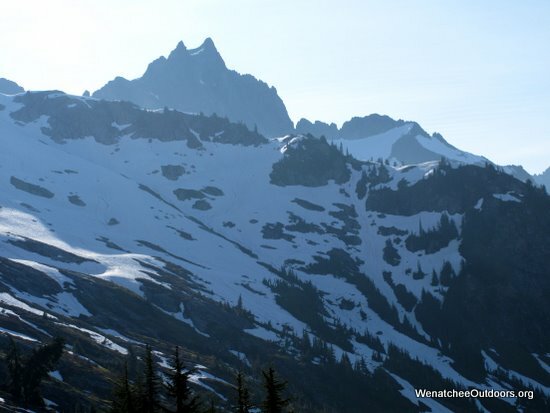 In mid-June, the duo from Wenatchee carried skis up Seven-Fingered Jack only to find the snow gone. Disgruntled, they returned from the mutant-digited mountain and declared their Eastside ski season over. That, however, did not deter them from looking farther afield for plank-footed opportunities. For the obsession of turning left, turning right, and turning left again, the two joined the metastasizing cancer of humanity, consumed an extravagant ration of oil, belched an obscene jigger of greenhouse gases, and struck out for snowfields west of the Cascade crest. Now at 4:40 a.m., Dumb and Dumber are trudging up the brutally steep trail bordering Eldorado Creek, climbing through an old-growth cedar forest sprinkled with the pleasant garnishes of Devil’s club, deadfall, and slide alder. Their packs, pregnant with ski gear, feel familiarly unpleasant, especially in light of their Highway 20 drive that indicated the skiing cup around them might be more than half empty. With their faith waning, they climb onward. And that’s when inspiration strikes. Seemingly the pace quickens and the load lightens as the charter members of Carry all Year (CAY) chatter about the movement’s future. Near timberline at the 5600-foot level, the founders of Carry All Year face a moral dilemma: Snow. 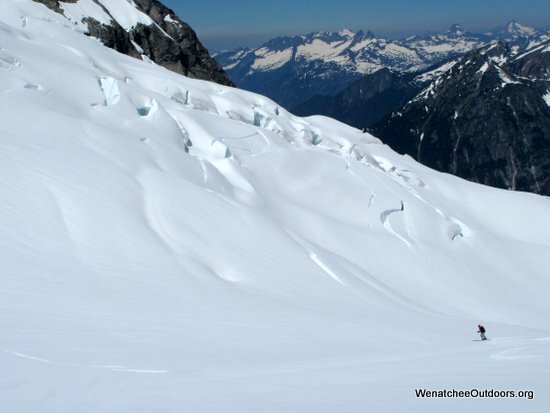 Enough snow to ski their planned circuit up and over Eldorado Peak, across to Tepeh Towers, down part of the McAllister Glacier, up another portion of the McAllister to the base of Klawatti Peak, with a return to this very spot. With a conspiratorial nod, they strip the packs and birth the skis. Six hours later when they return to this spot, they will have to live with the consequences of preaching one purpose and practicing another…of sacrificing principles for pleasure. Later when they repack skis and descend the green chastity belt of bush guarding these virginal snows, the charter members of CAY will wrestle with their seduction and the ease with which their greater purpose was desecrated. But here and now, with snow under foot and pleasurable peaks to pillage, Dumb and Dumber, like most of humanity, just don’t give a damn. Photo: The seduction of sin–skiing Eldorado. Best season. 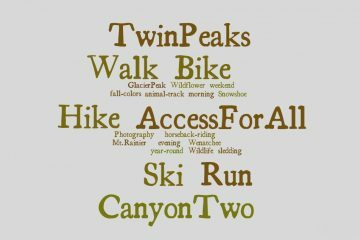 After the Eastside backcountry ski season melts away (usually between late May and mid June) a few Westside places to ski come to mind. The spectacular icefields surrounding Eldorado Peak is one such destination. Distances here are difficult to measure– the trail up Eldorado Creek to timberline is not an official trail and is a ridiculously steep climber’s trail that wastes no time on flat ground. Elevation. From the parking area (2,160 feet) to the summit of Eldorado (8,868) feet is a lofty schlep (roughly 6,700 vertical feet). Fitness level: 3 or 3+ (Advanced). Skill Level. 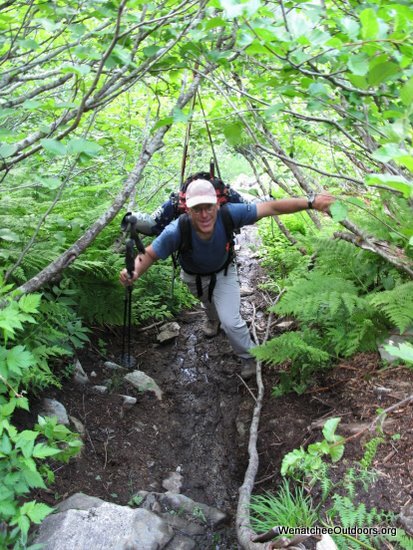 Hikers used to normal trails will find the approach trail difficult—call it a 3+ hike. Mountaineers used to traveling cross-country over rough ground will find the approach trail steep but straightforward. There is about 100 vertical feet of third-class climbing between Eldorado and Roush creeks. The actual skiing once you get above timberline is intermediate (2+) in technical ability. Skiing the Tepeh towers is easy technically but does involve crossing glaciers with some big crevasses. 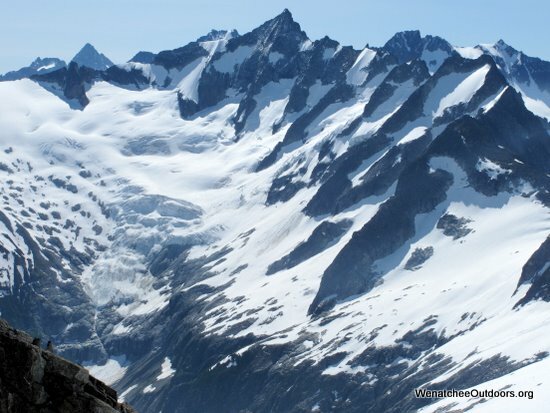 The same applies to skiing the top 1200 vertical feet of the McAllister Glacier. Access. Drive Highway 20 to Marblemount; then follow the Cascade River Road east. Park in a large parking lot on your left (south) about 100 yards past Milepost 20. Map. 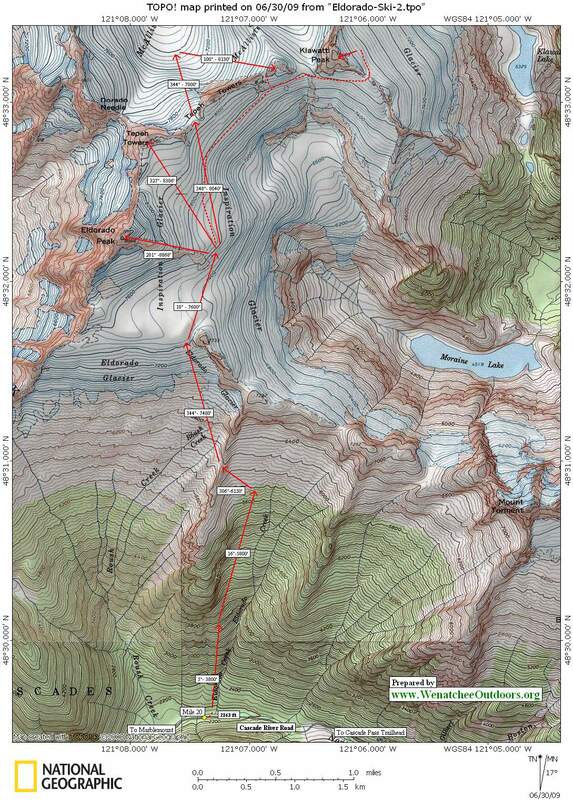 Print our topo map below of this trip on 8.5″ x 11″ paper in portrait mode. Walk about 100 yards west on the Cascade River Road and cross the Cascade River on a big fallen cedar right by the Milepost 20 marker. Note: Exactly where you cross the river can change from year to year as floods wash away and deposit new log jams. Once across the river, head in a northerly direction up steep slopes on the west side of Eldorado Creek. The creek is almost always close enough to hear. Somewhere near an elevation of 3,800 or 4,000 feet you’ll enter boulder fields with cliffs above you on the left. Staying fairly near the rock-vegetation border of these boulder fields work uphill, usually trending right. Look for cairns to help find the way. Between the different rock fields, are trails cutting through patches of slide alder. Keep working up the west side of the Eldorado Creek drainage and then climb up to a flat spot on the ridge confining the drainage at 6,150 feet. Drop over this ridge and climb down the opposite side for 100 vertical feet (steep and dangerous if you slip). This brings you into the headwaters of Roush Creek. Now head in a northerly direction up to the Eldorado and Inspiration glaciers and to the foot of Eldorado’s snowy east ridge. Follow the east ridge to the summit. See our map if you want to ski over to the Tepeh Towers or Klawatti Peak. Hazards. In winter and spring, huge avalanches can and do sweep down parts of this route. Know how to assess the hazard and follow routes minimizing your exposure. Crevasses will also be found and navigated around on the Inspiration Glacier. Recommended Equipment. 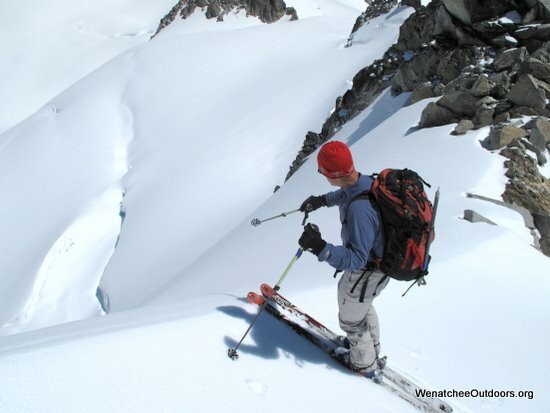 Ski crampons, avalanche safety gear, glacier travel gear, and an ice axe. 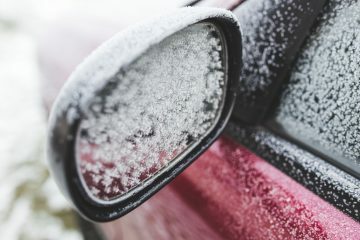 If cool weather has you suspecting icy snow conditions, crampons for your ski boots are also recommended. In late spring and early summer, it’s far easier to carry ski boots and hike up to snow level in approach or running shoes. Permits. Permits are not needed for parking or day use of the area. 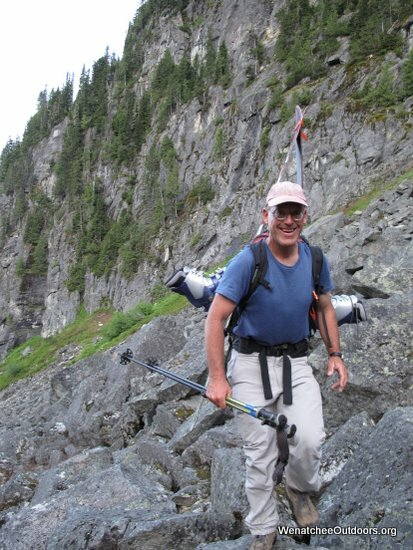 Overnight campers need a backcountry permit issued by North Cascades National Park (offices in Marblemount). Photos. 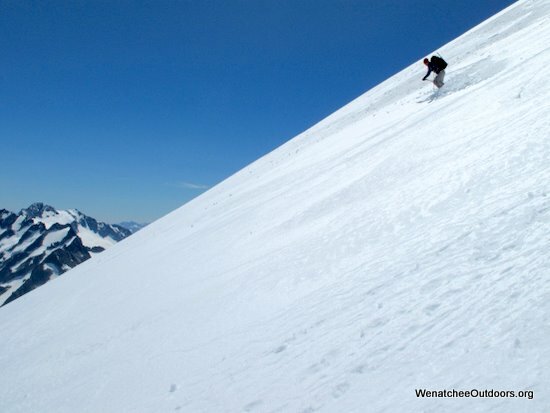 Left – Skiing the McAllister Glacier. Right – Looking down the McAllister.